Bottom collar outside dimension is 16"
Standard spark arrestors and rain caps that come with solid-pack insulated Class-A chimney systems don't hold up for long. When you need a replacement chimney cap, the HomeSaver Pro 10 Inch Round Chimney Cap for Air-Insulated Factory-Built Chimneys offers you confidence with its lifetime warranty. 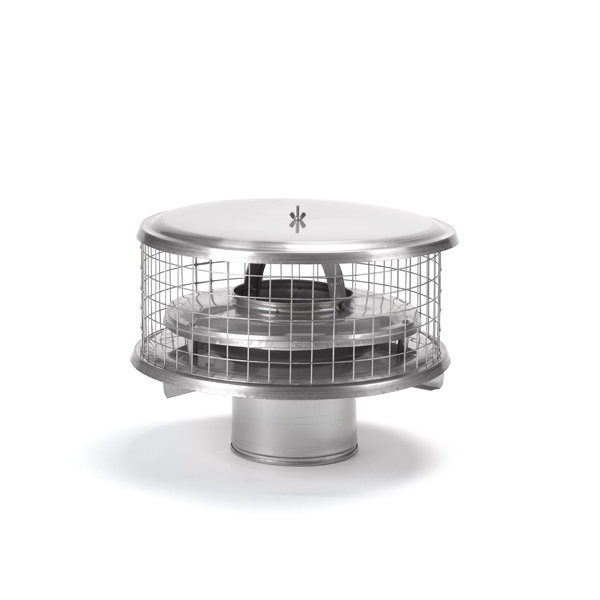 Tight, friction-fit installation allows the WHomeSaver Pro 10 Inch Round Chimney Cap for Air-Insulated Factory-Built Chimneys to slip down securely inside the chimney. It ensures a tight fit on virtually any brand of Class-A chimney that is air-insulated, whether double or triple walled. This HomeSaver chimney cap has a 1 inch mesh. This cap was ordered to replace the cap on my air cooled Majestic chimney. It fit perfectly, took only a couple minutes to install and is a much simpler cap to remove when it comes time for chimney cleaning. The OEM part required replacing after about five years...This one is made of stainless steel and should last much longer. I wish I had purchased this years ago. This bonnet fit perfectly after my flu was installed 30 years ago. Couldn't be more pleased. Great item, fast shipping! Great customer service! Product DOES what I needed it to do - no Worries. Very good item and this is why! 1: Communications with eFireplaceStore was as it should be; easy! 2: Item was shipped promptly. 3: Chimney Cap fit my 40 year 8" stack perfectly and with ease. 4: Chimney Cap has weathered 3 storms with no leaks or being blown out by wind etc. 5: Again "product does what I need it to"
ProsFor me, ease of installation, it looks good and it works great! Consfeels a little tinny but works fine. easy install and cap design is very effective. These guys made it easy. From ordering the correct product, to prompt shipping and final arrival of my chimney cap eFireplace Store made it all incredibly easy and at a great price to boot. Built well- a little pricey - but will last a ling time. Great Quality and was a breeze to install. FAST shipment. I had it installed three days after ordering. Took me 20 minutes to install, including climbing and getting dowm from the roof. Fit perfectly. awesome cap. just what I needed. quick shipping! this product is well constructed and easy to install. I also found efireplace to be of great assistance and prompt in the questions I had. Their price was also the best available. Very happy with my experiance with Elite Deals. Ordered one day, delivered one day later. Looks good, installs easily, construction seems solid. I would have prefered a tighter mesh spark arrester. Mounting is a friction fit. While it is tight, I am concered about our hurricane and Nor'ester force winds. I will probably build my own ss security tabs. Maybe "Elite Deals" would like to sell them for me, as an accessory. Timely delivery. Superior product price/value. DIY Instructions could have been clearer about friction fit collar. Easy access to clean flue. I will consider this vendor for future on-line purchases.